Les mones Pitussa son tradició a casa Llauradó-Vilà, i sembla que cada any augmenten la quantitat d'ordres, i no m'extranya. 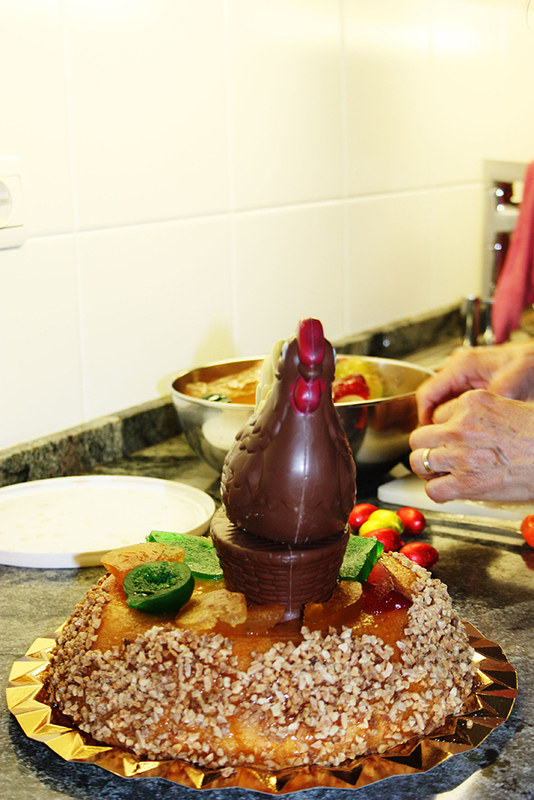 Una setmana abans de Pasqua, es prepara el forn, es fan viatges a la confiteria, els ous i la farina es multipliquen, les ametlles es torren, s'escullen les plumes colors i tota la xocolata comencen a invadir la cuina. Per qui no hagi tingut el privilegi de sentir l'olor que desprèn la fàbrica de mones Pitussa, no os preocupeu, m'imagino que al cel fa un olor bastant similar. L'altre dia, esmorzant amb el meu germà, que ha estat 10 dies aquí a Seattle amb mi, durant una estona em venia olor de fàbrica de mones Pitussa. Jo no se si era la imaginació, telepatia o que de veritat arribava fins aquí, a l'altra punta de món, però va ser un moment de gloria tot i no estar allà. Els que hagin tingut el privilegi de provar les Mones de la meva mare, sabran de què parlo. Bueno mones, i tot el demés que es proposi. La meva mare té talent, traça i tot el que ve després. Si algún dia arribo a la meitat del seu nivell em donaré per satisfeta... de moment tinc molta feina per davant! Per això vaig nombrar aquesta pàgina com ella, per veure si se'm pega algo. Només d'imaginar-me l'olor que deu fer ara casa meva amb tota la fàbrica de mones que té muntada em cau la llàgrima. L'any passat vaig poder-li donar la primera mona a la meva estimada fillola Maria en persona, un moment molt especial que no oblidaré mai. 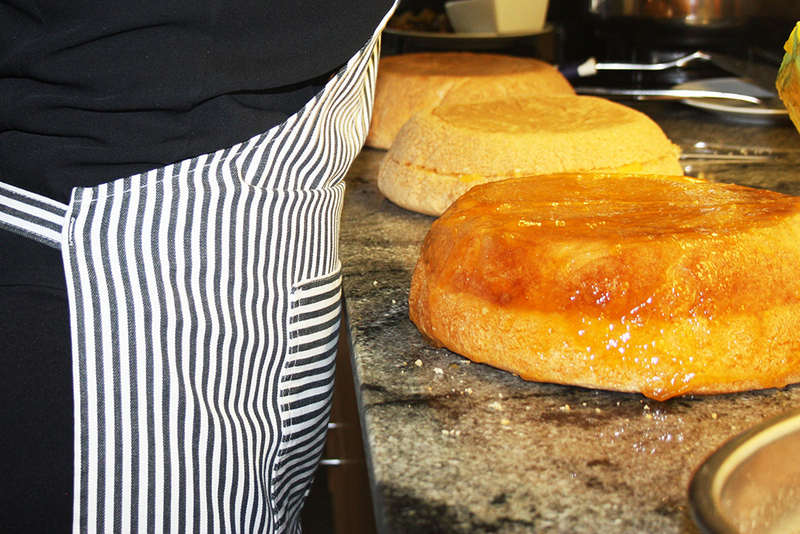 For those of you who don't understand Catalan and you've never heard of the "Monas de Pàsqua", this is a tradition typical of the spanish confectionery during the Holy Week, mainly in the areas of Catalonia, Valencia, Murcia, Aragón and Castellano-Manchega, they have a similar cake called roscón in Galicia, Jaén and Asturias. The Mona is a celebration of Easter and the end of abstention of this time of the year and on Easter Sunday, after church, the God Mother gives a Mona de Pàsqua to the child and it is tradition to get together the next day (it is a Holiday in Spain) and go somewhere, usually in nature and eat it along with good food. 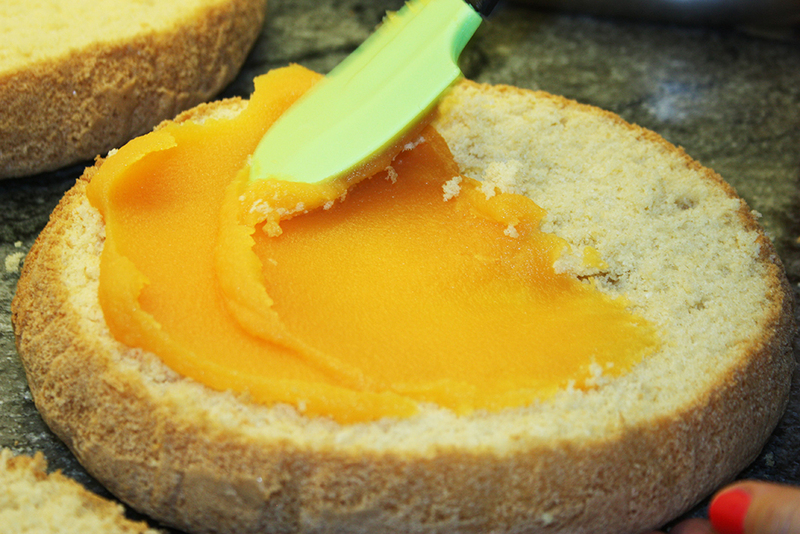 It used to be a simple cake similar to a brioche with a hard egg in the middle. And there were as many eggs as the age of the child, and over the years it has evolved to be what you see in the pictures. 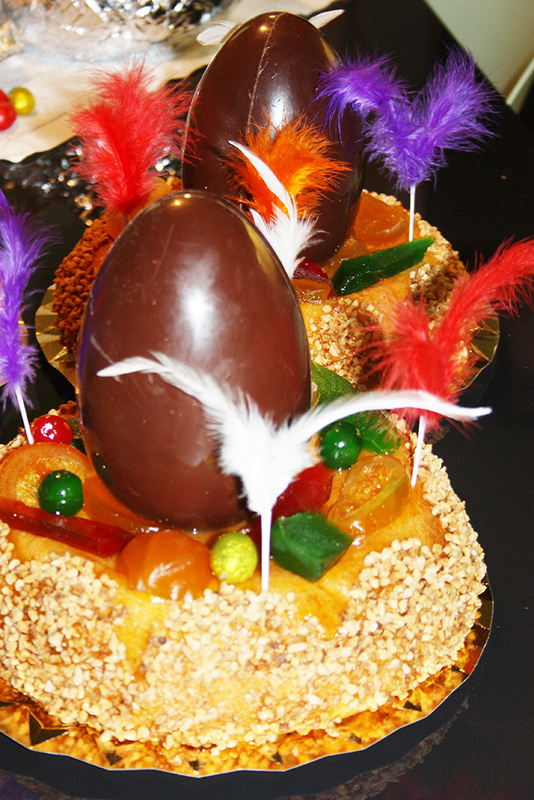 You can find many different variations depending on the place you buy it, but it is basically a base of "sponge biscuit" filled with en egg base paste and covered with peach jam and roasted almonds, and they are decorated with confited fruit, feathers and of course a chocolate egg. You can get fancy there and some started choosing their favorite characters made in chocolate, but I honestly like the traditional simplicity of the egg. I became a God Mother last year of the most beautiful girl, and I was able to give her the Mona in person (picture above). Last year I was home during this special time, and I was able to snap some pictures of the elaborated process of making these, she usually makes 10-12 Monas total. 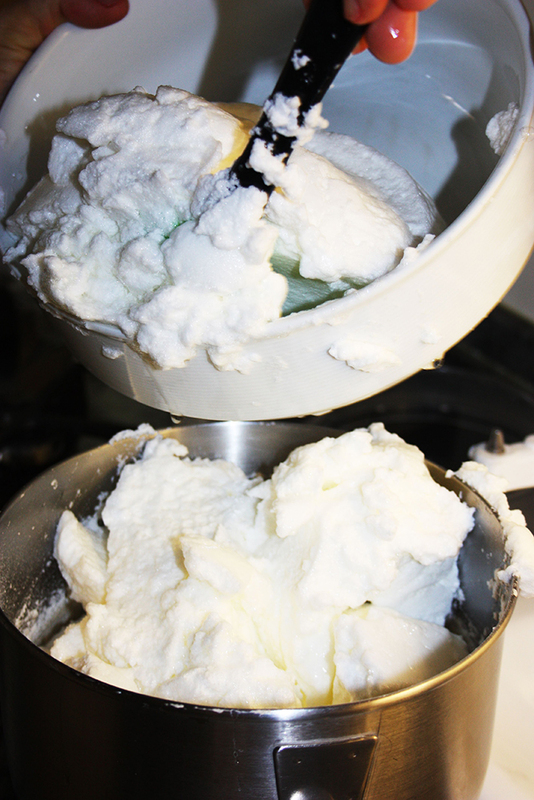 Enjoy the delicious pictures, I hope you can imagine the smell! Aquest és el collage que vaig fer a l'any 2010 de les Mones Pitussa. This is the collage I made back in Easter 2010 of the Mona Factory.